The main reason I started this blog was to find out about the origins of the Folksong class, and hence my own boat ‘Blue Mistress’. I have learnt a great deal and met some good people from doing so, but after nine months I still only had part of the Folksong story. 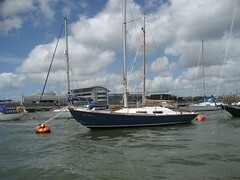 On Saturday, thanks to a small note in Sailing Today, I found a new website www.yachtbrochures.co.uk, run by Mike Davies. Included in a very long list of class names is “Folksong, Eric Berquist, 1983”. Search over. Mike replied almost immediately to my email and the transaction was completed within a few minutes. An excellent service. Thank you. So I have received a brochure written for the Southampton International Boat Show, Mayflower Park, 17-24 September 1983 (Stand B10). From this I learn that the Folksong was originally sold as “a thoroughbred cruiser/racer you can afford”. There’s more. If you own a Folksong and would like to discuss it, please contact me. Alternatively, I recommend Mike Davies’ website. I have a Folksong Storm Petrel. I am trying to find a rigging plan. The mast is of a home construction and incorporates running back stays which are a pain. The surveyors report suggests that a conventional back stay be fitted and that jumper stays are also installed. I have spoken to a rigger and discussed the mast and the report, and he recommends fitting a new mast. The mast at the moment has straight spreaders. And i don’t know if the positioning of the shroud plates are original for the design of the boat. I would welcome any information that you could forward to me. I jusyt bought a Folk Song, haven’t sailed for a few decades, so was wondering if you have any extra info you referred to, maybe including internal layout and equipment? I home completed a Folksong in 1984 and still have both the boat, Bergqvist’s advertising material (including price lists), Sail plan, internal layout drawings and even the Bowman boats spar assembly instructions. I am going to buy a 1984 Folkboat in Portugal the name is “Betsy”. Hello, i have recently dragged an IF out a local farm and am in the process of trying to restore her. She has been high and dry for the last ten years. I am seeking info on plans for the standard and running rigging. Any assistance and feedback is welcomed. Hve just bought a FolkSong 25 and would like a copy of your material, would be happy to pay repro costs! The Folksong Storm Petrel referred to above belonged to me for about 8 years and I changed the rig in New Zealand from a fractional to a mast-head, but 5ft.down from the mast-head,hence the running backstays.The rig was far more stable after that and I completed the circumnavigation via South Africa with no problems. It was a superb sea boat despite a sloppy fibre glass layup,One side of the hull was several inches lower than the other and twice I filled holes in the keel where the steel shot ballast was falling out ! Hi Bill.Three monts ago I became proud Folksong26 ouner and prepare her for round world,which means…repairs,adjusts…reinforsings.I am looking for grawings on Hasler SP windvane,which I habe seen on many Folkboats and think is the best for my boat.If you can send me drawings to make for my boat it will be gteat.Or if you send contakts on others who have drawings.I coul buy used vane if it in good order and cheap,but prefer to make it. All the best. Jordan. There’s plenty of detail here. A reasonably competent person should be ably to sort something out from this info,either that or trawl a few boat jumbles for a used navik. There are a few about. You may possibly believe that it is at just “ikea”. Flipping it swiftly shows the countless choices for today’s fashionable meal fixing shows.